CambridgeTimes Article: Crowe stars in United tourney win. 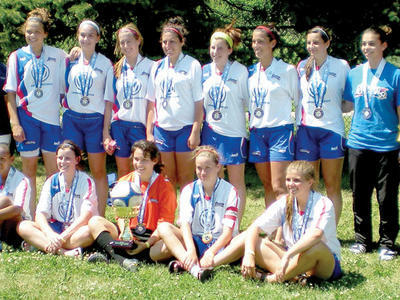 The U16 Cambridge United girls team had a fantastic showing in the 45th Robbie International Tournament this weekend. After a first game loss to Wexford Fury 1-0 the team bounced back to win the next 2 games by the score of 1-0 and 2-0 against U16 West Ottawa and U16 Bon from Winnipeg. In the semi-final play-off round the team had to play a very talented and hard working team from our very own club, the U15A girls. It was a hard fought battle that finished with a 1-0 win for the U16 program and an opportunity to play in the finals against the U16 NSD Saints from Calgary. In the finals, Cambridge played hard and stuck together winning the championship game 2-0! Aubrey Formica was announced Player of the Game at the award ceremony and the U16 Cambridge United team ended up winning the tournament going 4-0-1 (W-T-L). Once again, the players, staff and parents represented the CYS and the City of Cambridge with a great deal of pride and class all weekend long. Congratulations to the Coaching Staff, players and parents. Posted in Sports and tagged Cambridge Ontario, Ottawa Fury, Robbie International Soccer Tournament, Soccer. Bookmark the permalink.